Cefixime used to be the first line treatment for gonorrhea. Certain strains of the gonorrhea infection may become resistant to Cefixime. The antibiotic is therefore no longer recommended and available. The recommended best treatment for gonorrhea is by injection. You can book an appointment for an injection at your local Superdrug clinic. To book an appointment, fill in our brief medical questionnaire. One of our doctors will review your information and confirm whether the injection is suitable for you. Once our doctor has approved your injection, you can confirm your appointment. 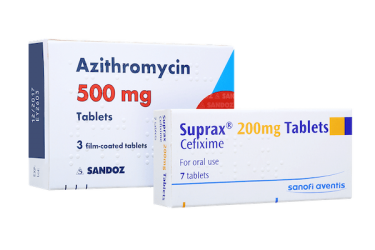 Cefixime is a prescription-only antibiotic, which used to be given for the sexually transmitted disease gonorrhea. Cefixime is no longer recommended for the treatment of gonorrhea. Cefixime should be taken with a drink of water. It does not need to be taken with food. Can you take cefixime and drink alcohol? There are no known interactions between cefixime and alcohol, so drinking alcohol won’t make your treatment less effective. What does each cefixime tablet contain? Each tablet contains 200mg of cefixime. The tablets also include pregelatinised starch, calcium hydrogen, microcrystalline cellulose, magnesium stearate, phosphate dihydrate, hypromellose, macrogol 6000 and titanium dioxide (E171). Ingredients may vary depending on the manufacturer. Cefixime is also sold under the brand name Suprax. Some patients experience side effects when taking cefixime. Suprax is a branded medication which contains the active ingredient cefixime. It works in the same way as cefixime tablets and can cause the same side effects. Suprax can be slightly more expensive than the generic medication.